A simple curry made with nutrella & Aloo. 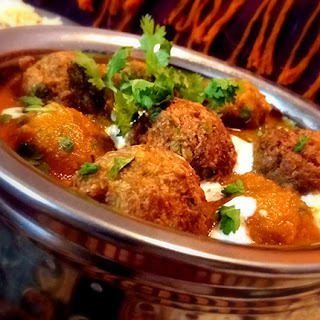 This curry can be spiced up by increasing the oil and potatoes in the recipe as well as the chilly powder. 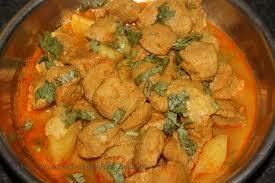 A simple curry made with Soya Chunks & Potato. This is a low fat and healthy . Method- Fry the onions in 1 tsp of oil till lightly browned. Remove from heat, when cooled, grind into a paste. Fry the soaked chunks in 2tbsp of oil, till slightly browned on all sides. Soya Cutlet is good for health and especially for kids. It contains rich in fiber. 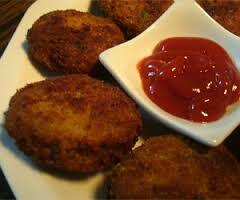 Soya Chunks Cutlets is very attractive and delicious recipe. This Cutlets is very easy to prepare. Take hot water and soak the soya chumk or granule. Cover with a lid and let it rest for 15 mins by which time the soya must have doubled in size. Now drain the water and rinse cold water. Squeeze off the excess water with your hands and grind them. Now Cook the potatoes and mash them as well. Put grind chunks and potato in a mixing bowl and mix properly. 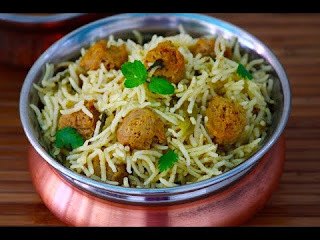 Soya Pulao is a complete meal for lunch or dinner also.